Ninety percent of Africans arriving to the Americas as slaves were brought to Catholic Latin America. From the moment they stepped foot in the “New World,” Africans were introduced to the Christian faith by missionaries and their slave masters. What was the relationship between Christianity and African slavery? How did developing racial categories and ideologies emerge from and influence the process of African Christianization? And how did newly arrived Africans make sense of and relate to this new faith and its messengers? 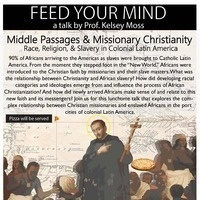 Join us for this lunchtime talk that explores the complex relationship between Christian missionaries and enslaved Africans in the port cities of colonial Latin America.